From Oudtshoorn, travel along Baron Van Reede Road towards the Cango Caves. As you leave Oudtshoorn, the road becomes the R328. Travel 23km towards Cango Caves, just before the Cango Caves turn left at the sign “Prins Albert”. Travel 12km’s towards the foot of the Swartberg Mountain Pass and turn left at the sign board that says “Calitzdorp / Matjiesrivier. 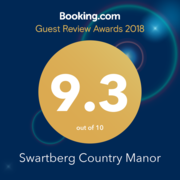 Travel 5km’s and Swartberg Country Manor will be located on the right hand side of the road.